In France, Memphis found his feet again and has thrived ever since. So much that now he is being linked to a Premier League return. Manchester City and Liverpool are reportedly interested in the Dutch player. Depay has not ruled out a Premier League return. Depay's asking price is in a region of €65 million Euros. Liverpool could soon be in search a winger if Sadio Mane decides to leave Merseyside for Real Madrid. 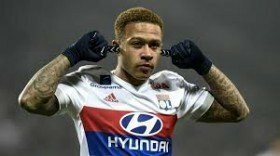 Depay could be an ideal successor to Mane. Just like Mane, Depay is fast paced, agile and produces moments of brilliance throughout the match. If he signs for Manchester City, he might have to fight for a place with Raheem Sterling, Leroy Sane and Bernardo Silva. Memphis Depay's move to Premier League can soon become a reality. It's just a matter of time for clubs to jump in the market for talented Dutch star.